The reports after the magnitude 7.5 earthquake and tsunami that struck Palu, Indonesia indicate that the death toll is more than 1,200, and food and water for the survivors requires police presence as they become desperate. Downed communications lines block roads, preventing travel and treating hundreds of injured people. The U.N. humanitarian office recognizes that the needs are urgent with people needing shelter, clean water, food, fuel and emergency medical care. Additional complications with the water supply indicate that the water supply infrastructure has been damaged. Offers of assistance have come from more than 25 countries after the Indonesian President Joko “Jokowi” Widodo appealed for international help. The government is coordinating emergency efforts, and U.N. and relief agencies are on the ground or enroute, and agencies are working closely with the government to provide technical support. 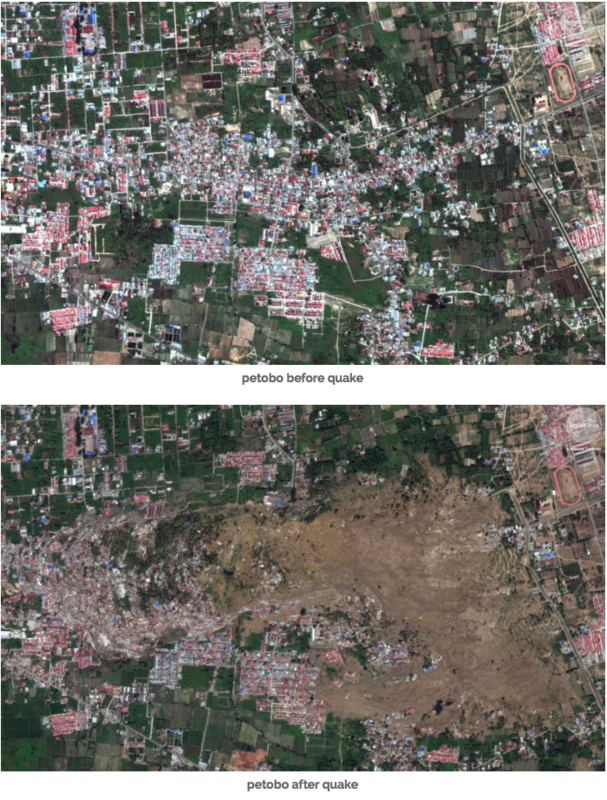 The before and after photos here are provided by Satellite image ©2018 DigitalGlobe, a Maxar company, courtesy of Via Maxar News Bureau.